Five weeks. Yep. It’s true. Five weeks since my last post. Oopsie! 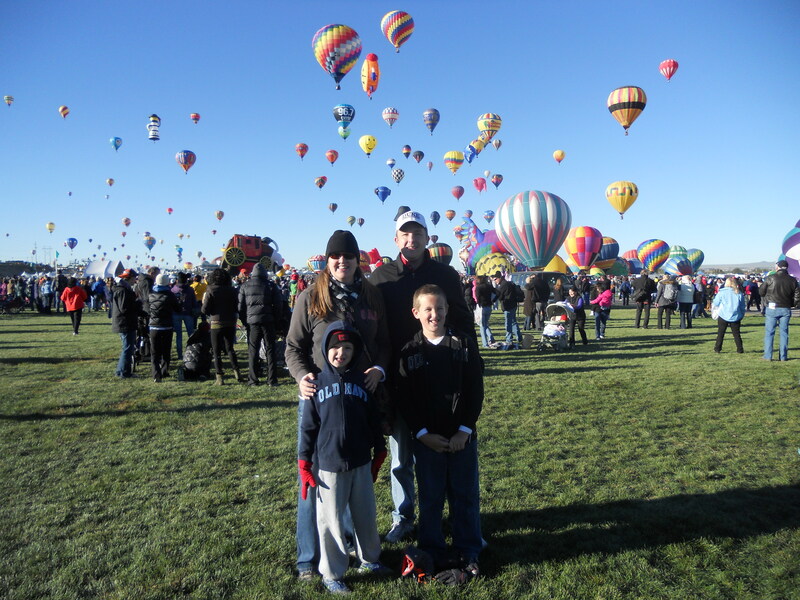 My family – including my family of four, my parents, my brother and his family of four – went to my hometown of Albuquerque, New Mexico, for the International Hot Air Balloon Fiesta. Of course I’d been several times growing up in ABQ, but it remains one of the most amazing events I’ve ever been to. My husband had been with me once before we had kids, and I took my oldest son when he was 18 months old. It’d been eight long years since I’d seen those balloons in person. And it was every bit as magical as I remembered. 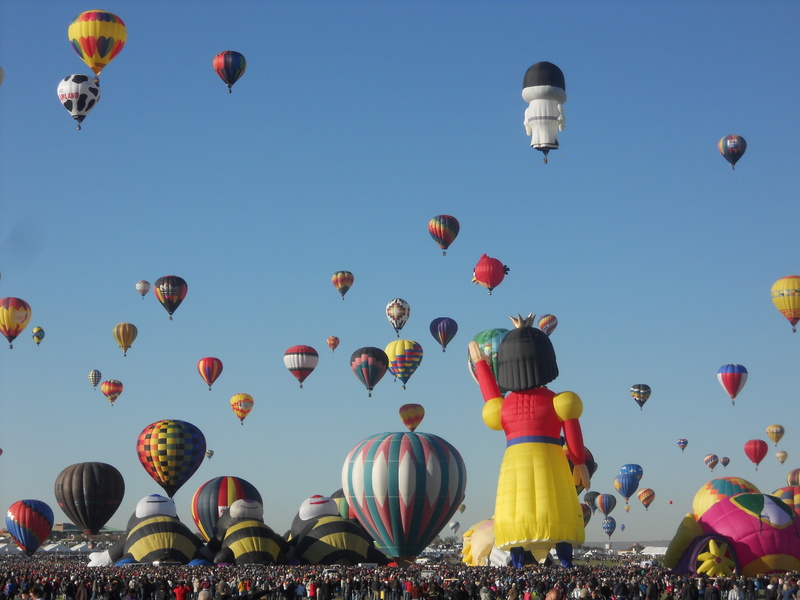 We ate our way through Albuquerque, hitting all my old favorite restaurants along the way, but I didn’t gain any weight because we walked and walked and walked around the Balloon Fiesta Park. We burned off every goodie we indulged in that weekend, including my favorite – sopapillas with honey. Mmm-mmmm! Before we could leave ABQ, I caught a cold that several of my family members ended up sharing and missed a couple of days of work the next week. No exercise occurred. Then the following weekend my husband and I escaped for a weekend getaway. I bought him tickets to see Dana Carvey for Father’s Day, and it was finally time to redeem them! We stayed in the upscale little town of Frisco, Texas, which we had visited last fall for a friend’s wedding. Again, we ate our way through the town, but again, we walked off most of it in the fabulous Stonebriar Centre mall and a Premium Outlet mall we found nearby. My favorite meal was at the Cheesecake Factory. 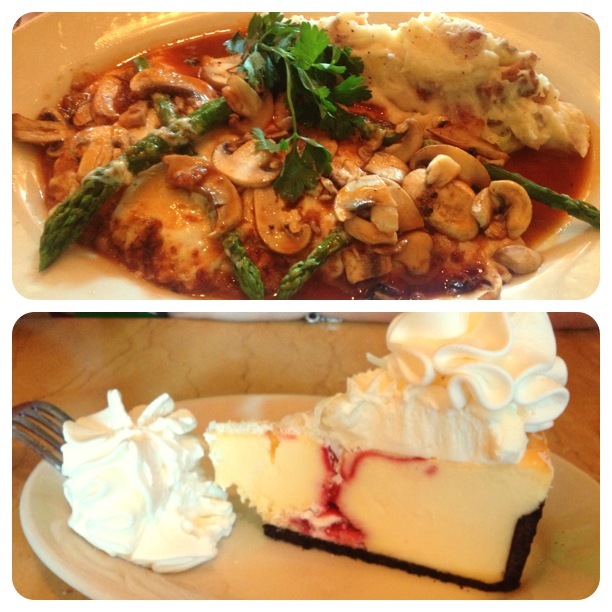 I had their popular Chicken Madeira and a piece of white chocolate raspberry cheesecake. Heaven. The Monday following our trip, I finally got back on the exercise wagon. I have only lost one pound during the month of October, but I’m okay with that considering all the activities and foods I enjoyed. I’m back in the groove with my blog now, too, and I’m going to try my best to stick to my goals during the fast-approaching holiday season. Halloween is Thursday – and that will provide me plenty of bite-sized temptations – then Thanksgiving and Christmas will be here before we know it! Don’t be surprised to find a few more gaps in the blog as we enter the holiday season, but I’ll do my best not to have any more five-week lapses. I’ve missed this! Thanks for taking the time to catch up with me. Goodnight, friends!